Northeast Real Estate Business magazine covers the multifamily, retail, office, healthcare, industrial and hospitality sectors in the Northeast United States. 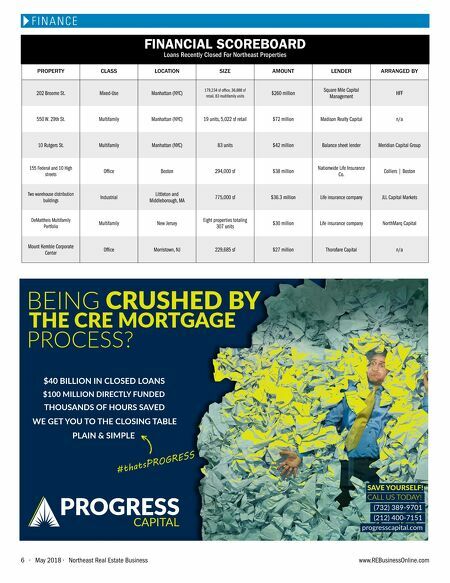 www.REBusinessOnline.com Northeast Real Estate Business • May 2018 • 7 N E W Y O R K Let us help you BUILD FOR THE FUTURE CountryBankOnline.com M A N H AT TA N | S C A R S D A L E | 8 8 8 . 2 1 2 . 6 8 6 8 | R I V E R D A L E | W O O D L AW N M E M B E R N Y C E , P L U S | M E M B E R F D I C | E Q U A L O P P O R T U N I T Y L E N D E R Call our loan experts today! 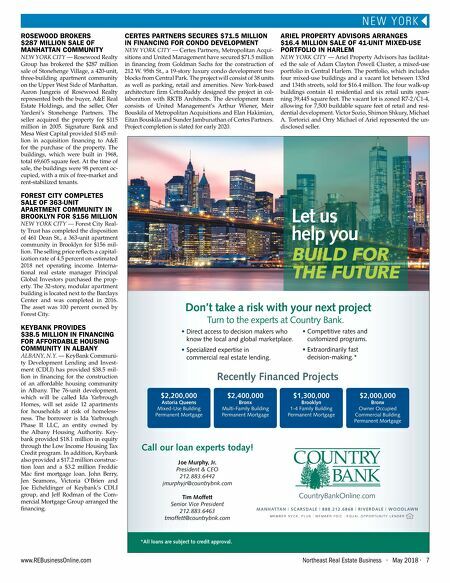 Joe Murphy, Jr. President & CEO 212.883.6442 jmurphyjr@countrybnk.com Tim Moffett Senior Vice President 212.883.6463 tmoffett@countrybnk.com *All loans are subject to credit approval. Recently Financed Projects Turn to the experts at Country Bank. • Direct access to decision makers who know the local and global marketplace. • Specialized expertise in commercial real estate lending. Don't take a risk with your next project • Competitive rates and customized programs. • Extraordinarily fast decision-making. * $2,400,000 Bronx Multi-Family Building Permanent Mortgage $1,300,000 Brooklyn 1-4 Family Building Permanent Mortgage $2,000,000 Bronx Owner Occupied Commercial Building Permanent Mortgage $2,200,000 Astoria Queens Mixed-Use Building Permanent Mortgage CERTES PARTNERS SECURES $71.5 MILLION IN FINANCING FOR CONDO DEVELOPMENT NEW YORK CITY — Certes Partners, Metropolitan Acqui- sitions and United Management have secured $71.5 million in financing from Goldman Sachs for the construction of 212 W. 95th St., a 19-story luxury condo development two blocks from Central Park. The project will consist of 38 units as well as parking, retail and amenities. New York-based architecture firm CetraRuddy designed the project in col- laboration with RKTB Architects. The development team consists of United Management's Arthur Wiener, Meir Bouskila of Metropolitan Acquisitions and Elan Hakimian, Eitan Bouskila and Sunder Jambunathan of Certes Partners. Project completion is slated for early 2020. ARIEL PROPERTY ADVISORS ARRANGES $16.4 MILLION SALE OF 41-UNIT MIXED-USE PORTFOLIO IN HARLEM NEW YORK CITY — Ariel Property Advisors has facilitat- ed the sale of Adam Clayton Powell Cluster, a mixed-use portfolio in Central Harlem. The portfolio, which includes four mixed-use buildings and a vacant lot between 133rd and 134th streets, sold for $16.4 million. The four walk-up buildings contain 41 residential and six retail units span- ning 39,445 square feet. The vacant lot is zoned R7-2/C1-4, allowing for 7,500 buildable square feet of retail and resi- dential development. Victor Sozio, Shimon Shkury, Michael A. Tortorici and Orry Michael of Ariel represented the un- disclosed seller. ROSEWOOD BROKERS $287 MILLION SALE OF MANHATTAN COMMUNITY NEW YORK CITY — Rosewood Realty Group has brokered the $287 million sale of Stonehenge Village, a 420-unit, three-building apartment community on the Upper West Side of Manhattan. Aaron Jungreis of Rosewood Realty represented both the buyer, A&E Real Estate Holdings, and the seller, Ofer Yardeni's Stonehenge Partners. The seller acquired the property for $115 million in 2005. Signature Bank and Mesa West Capital provided $145 mil- lion in acquisition financing to A&E for the purchase of the property. The buildings, which were built in 1968, total 69,605 square feet. At the time of sale, the buildings were 98 percent oc- cupied, with a mix of free-market and rent-stabilized tenants. FOREST CITY COMPLETES SALE OF 363-UNIT APARTMENT COMMUNITY IN BROOKLYN FOR $156 MILLION NEW YORK CITY — Forest City Real- ty Trust has completed the disposition of 461 Dean St., a 363-unit apartment community in Brooklyn for $156 mil- lion. The selling price reflects a capital- ization rate of 4.5 percent on estimated 2018 net operating income. Interna- tional real estate manager Principal Global Investors purchased the prop- erty. The 32-story, modular apartment building is located next to the Barclays Center and was completed in 2016. The asset was 100 percent owned by Forest City. KEYBANK PROVIDES $38.5 MILLION IN FINANCING FOR AFFORDABLE HOUSING COMMUNITY IN ALBANY ALBANY, N.Y. — KeyBank Communi- ty Development Lending and Invest- ment (CDLI) has provided $38.5 mil- lion in financing for the construction of an affordable housing community in Albany. The 76-unit development, which will be called Ida Yarbrough Homes, will set aside 12 apartments for households at risk of homeless- ness. The borrower is Ida Yarbrough Phase II LLC, an entity owned by the Albany Housing Authority. Key- bank provided $18.1 million in equity through the Low Income Housing Tax Credit program. In addition, Keybank also provided a $17.2 million construc- tion loan and a $3.2 million Freddie Mac first mortgage loan. John Berry, Jen Seamons, Victoria O'Brien and Joe Eicheldinger of Keybank's CDLI group, and Jeff Rodman of the Com- mercial Mortgage Group arranged the financing.